Encore Care Homes > News > Encore News > Be an Effective Leader! Many Congratulations to our second cohort on our Be an Effective Leader course! The staff from Hamble Heights, Great Oaks Bournemouth and Fairmile Grange delivered their end-of-programme presentations to the group, which included the Home Managers and Encore management. 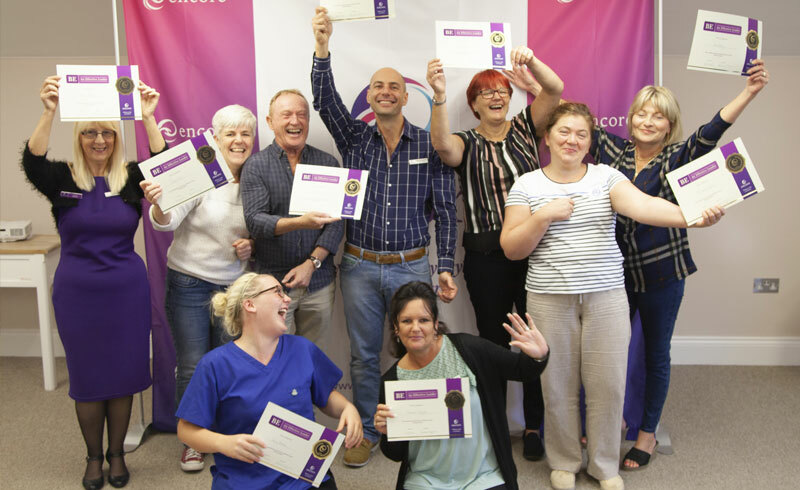 The successful cohort were awarded their certificates by CEO of Encore, Rachel Dryden. All the presentations were fantastic and showed different elements of self-reflection and development. Each one was different in its delivery and brought something unique to the experience. The group celebrated afterwards with lots of cheers and some delicious cakes made by Head Chef Patrick from Great Oaks! A fantastic achievement – well done to Mihaela, Carol, Vanessa and Sue from Hamble Heights; Sue, Patrick and Tony from Great Oaks; and Jane and Jenny from Fairmile Grange!